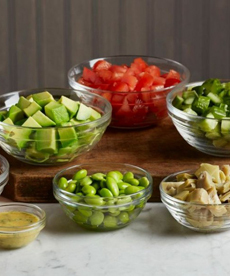 Layering is trending as a light and refreshing approach that makes you want to eat more salad. The contrast of different colored vegetables (and fruits) make the food all the more tempting. This recipe is by Zac Benedict for the California Avocado Commission. This recipe uses 12-ounce mason jars, a main-dish size salad for each person. You can also use 16.5-ounce mason jars. The handled jars can be used for food or drinks. If you don’t want to buy mason jars, check to see what you already have; for example, glass dessert bowls or jumbo wine goblets. 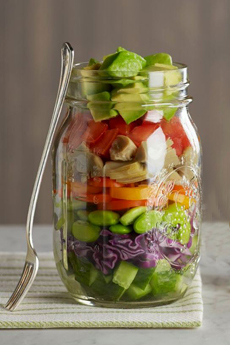 Use smaller jars for a side salad. Zac suggests collecting large baby food jars, and for the larger mason jars uses chopsticks, which easily reach the bottom of the jar. The idea is to eat the the layered salad from the jar, although Zac advises that you can also set out serving bowls for people who want to toss their salads. Select vegetables with a variety of color. For example, if you like scallions but have too much green, substitute red onion. If you’re using red tomatoes, use orange and yellow bell peppers instead of read ones. Is there a prettier salad? Photo courtesy California Avocado Commission. You can also add diced meats and cheeses, cooked grains, beans and legumes. 1. LAY out the rinsed, dried, cut produce ingredients. 2. PLACE the heaviest ingredients on the bottom and the most crushable items at the top. Try to be as even as possible: The layers don’t have to be perfect but they look very nice when the ingredients are in neat rows. 3. CHOOSE your dressing; keep it separate until ready to eat. This recipe uses a fresh citrus Dijon dressing, which is poured over the salad ingredients before serving. Then, seal with the lid and then gently invert the jar a few times to disperse the dressing. Another option is to place the dressing in the jar before layering the salad ingredients. 1. PLACE the ingredients in a small jar with a lid; shake until well-blended. 2. POUR dressing over each of the layered salads. Seal with jar lid and serve. *You can make the dressing sweeter or more tart to your liking depending on which citrus juice you use. Find more delicious recipes at CaliforniaAvocado.com.